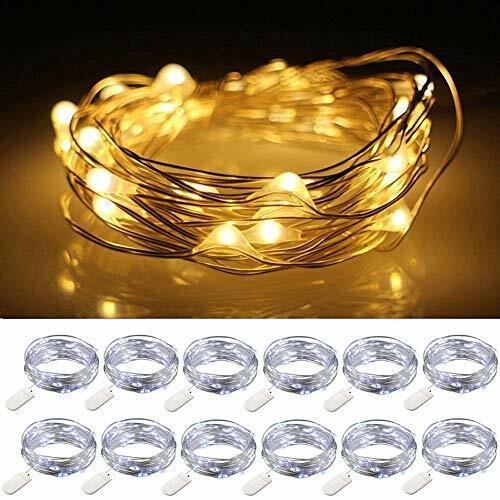 12 Pack LED Starry String Lights can give you more choices to decorate your home or garden, wrapped around wreaths, trees, flowers, weddings with bouquets, plants, signs, furniture and almost everything else. Made with Flexible Bendable Silver Wire that can Conform to any Shape you want, to create a Beautiful and Romantic Atmosphere for whole space. Low Heat Emission, Saving Light Power, Energy-saving and Environmentally Friendly. ON/OFF switch on battery box, so you can turn it on or off easily. With the small battery compartment, you can easily carry and place the lights anywhere you like. To replace batteries, just open the battery case and make sure you put the batteries in the correct position. *Only the wire is waterproof, the battery box isn't, so please keep it away from water. *Starry String lights is creative idea for any decorative project, but not use it as an illuminating light. If there are some problems when using our products, please feel free to contact us and our customer service will reply you within 24 hours.